Security Windows 7 - Uninstalling McAfee LiveSafe on Windows 7? 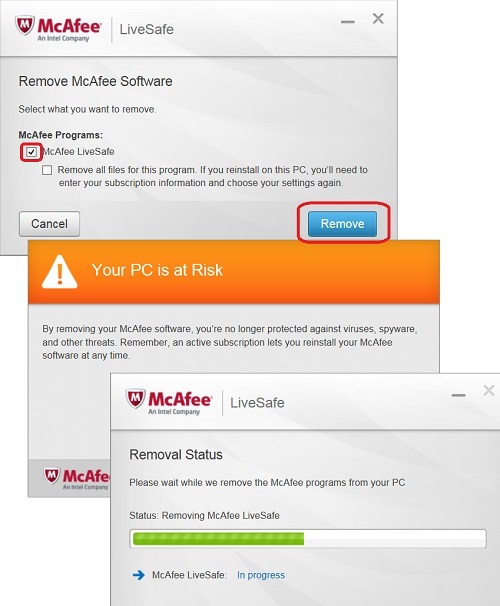 How to uninstall McAfee LiveSafe on Windows 7? I don't like the expired trial version of McAfee LiveSafe displaying the security warning popups. If you bought a new computer, it may come with the trial version of McAfee LiveSafe application. We can enjoy few months of free antivirus protect. 1. Go to "Control Panel > Programs > Uninstall a program" uninstall the trial version of McAfee LiveSafe. 2. Locate "McAfee LiveSafe" and click "Uninstall". You see the "Remove McAfee Software" screen. 3. Check "McAfee LiveSafe" and click "Remove". You see another warning message: "Your PC is at risk". 4. Close the warning message and wait for the uninstallation process to finish. When the uninstallation is done. You will never see the "Your device isn't fully protected" popup message again. ⇐ 'Your device isn't fully protected' on Windows 7?